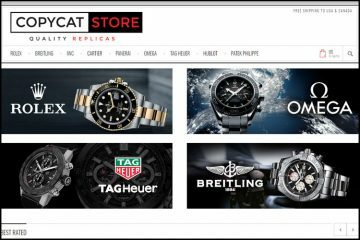 The Internet is full of replica watch companies. This gives us the opportunity to compare and find the ones that offer the greatest quality and the best prices. The real problem is that the more they are the harder it is to separate the trustworthy merchants from the companies you should really stay away from. Let’s see in which category Replicawatchesonly.co.uk falls into. The prices are in GBP so I guess it is safe to say that the company targets mainly UK customers. Whereas the products, these are very cheap. The Japanese watches start at 44GBP while the Swiss watches cost about 150-300GBP. I am usually very skeptical when it comes to very low prices, especially prices lower than the average. Everything comes at a price in this world and you usually get what you pay for. If decent quality is what you want then don’t be a pinchpenny. 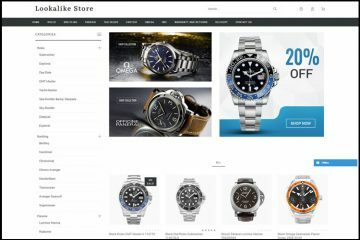 The website has two menu bars: one at the top where you find the top five best-selling brands and a left side menu bar where there is an impressive number of available watch brands. The collection is really huge. 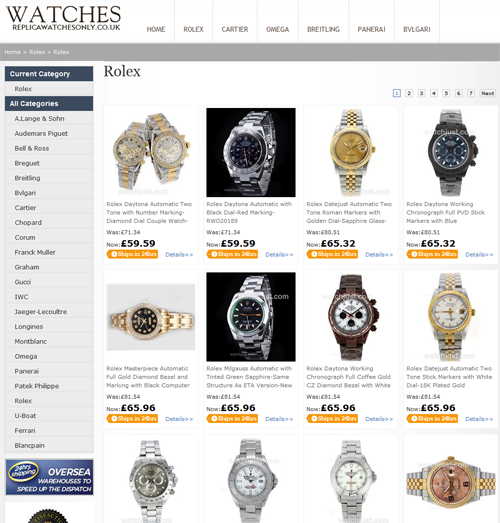 Just the Rolex category includes 5038 designs so you can simply imagine how many products the company really offers. Dividing each category into sub-collection is a life saver. 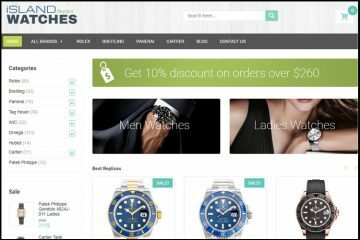 Think of how difficult it would have been to browse through 5038 Rolexes and find your perfect replica watch on the very last page of this endless category? The product page is quite brief and to the point. The specifications of each watch are actually a two columns table, and a very short one. Here you have listed the main details for Movement, strap, dial, gender and weight. Instead of the description section you will find pasted product pictures. And if you are not in a hurry, you can also admire the hearts rating system and maybe leave a short review for the product. When you enter replicawatchesonly.co.uk it instantly hits you: it’s plain awful. I don’t want to be mean or anything, but the design is terrible. From the color scheme to the font, from the banners to the product photos, everything looks highly unaesthetic. Just like the main banner illustrates- the website is like a huge splash of incoherent and unflattering graphic elements. It certainly does not look like a classy online merchant of high end replica watches. Even though on the Homepage there is a banner saying “Free Shipping on All Orders”, the shipping isn’t really free. It is actually quite expensive. To major countries such as USA the shipping fee is $20 with EMS or $35 with DHL. The company claims that orders are usually shipped within 24-36 hours and that the delivery takes about 7-10 business days. The funny, but very worrying part from the Shipping page is where it says that the delivery is guaranteed. More exactly, “In the event that your package is failed to send to you for some reasons, we will reship once at your expense“. So the delivery is actually guaranteed by the fact that the customer will pay once more for his order. What kind of guarantee is this??? The return policy is horrible. The company provides a 14 days exchange or refund policy, but no repairs warranty after this time. The products need to be returned all the way back to China, which is costly and slowly. And as this wasn’t enough the items will be inspected upon arrival and if they do not meet their very long list of conditions for processing a refund or replacement then your complaint will remain unsolved . Simply horrible! The only option for paying on this website is with a Visa credit card. There is no other card or money transfer option available. This is pretty limited and also quite risky, at least from my point of view. We have all heard stories about Internet scams and about sites that take your card details and use them fraudulently. I feel more secure when there are also other options of payment such as Western Union, Bank Wire or Paypal. Customer service: I simply love companies that advertise a product or service they are unable to offer. Of course, I am being sarcastic! For example, replicawatchesonly.co.uk has a very flashy red live chat button on the site, but don’t be surprised when you discover that it isn’t functional. Like many other things on this store, it is just for show. Apparently the customer service should be available 24/7 or at least this is what they write on the Contact Us page. For any inquiries we might have we are encouraged to contact them by contact form or by email. 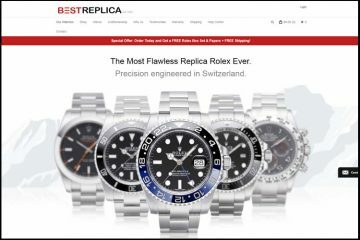 Summary: Replicawatchesonly.co.uk is just another Chinese based merchant who provides poor services and guarantees for its products. Of course, you are tempted to order from here because it offers incredibly low prices, but before going through with the order you should think it over and see if it is worth the risk. I for one wouldn’t take that chance.